A pregnant CrossFit trainer uploaded a video of her lifting a 40kg barbell to Instagram only to be harassed by commenters. Well, she's not going to take it. Being a new mom is tough work, and a lot of heavy lifting. From pushing a stroller loaded with all the essentials to bending down over and over (and over) to carry your babe from point a to point b, your body goes through quite the transformation once you give birth (in more ways than we have to tell you). 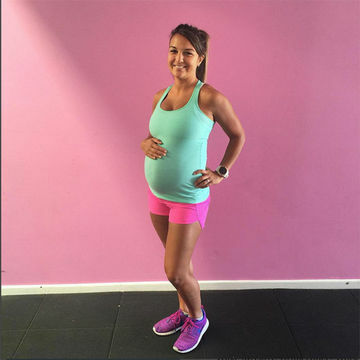 So you would think that Australian mom-to-be, Revie Schulz would be praised for working hard during her pregnancy instead of getting attacked for exercising while expecting. She's a CrossFit trainer and posted a video via Instagram of her doing back squats while holding a 40KG barbell at six months pregnant. Instead of collecting likes and applause, she was called "selfish," "self absorbed" and told she wasn't taking care of her body or her baby. Schulz didn't let it get to her though—she took to setting the record straight. "In a time where all you need as a mum-to-be is love and support, it has blown my mind that I have had to defend myself now, more than ever. Exercise does not hurt my baby, or me, but brazen, mean, uneducated comments do," she wrote on Facebook. She went on to explain that many of her fellow fitness influencers stopped posting their exercise to social media when they became pregnant and she never understood why, until now. And though she has to weed through the comments and see the backlash, Schulz isn't ashamed of working out—and isn't about to stop posting and inspiring her positive followers to stay active. "I have chosen to continue posting my fitness regime through pregnancy despite the negativity because it's what I believe to be best for my baby and myself," she wrote. "I'm not going to hide away from bullies. I never have and I never will."